An evening talking about Open Data?? Yes sir, yes sir, three bags full. I became aware of the Open Knowledge Foundation (OKFN) in early 2007 and immediately established contact with its Co-Founder, Rufus Pollock. Certainly within the last year or so, I have been more actively engaged with the OKFN and have been virtually attending their monthly Open Science Working Group meetings during that period. A few weeks ago, I spotted this tweet on Twitter alerting people to OKFN’s “first”  meet-up in Scotland. Being a resident of Glasgow, with the meeting being held across in Edinburgh, I immediately added myself to the attendee list here. Upon arrival at the venue on the day itself, being slightly early, I was the first to arrive followed shortly by Prof. Roderic Page who I met briefly at Science Online: London last September. Next to arrive was the organiser, Naomi Lillie who I met at the Open Research Reports hackathon in London last December. With her were Laura Newman and Sam Leon also from the OKFN. After a quick drink, the ‘flock’ of attendees present in the bar were ushered upstairs where a broom-cupboard majestic room had been booked for us. Wowsers – WHAT a venue. Chosen by Naomi despite having never been to the Ghillie Dhu before !! After a brief introduction and welcome by Naomi, Mark MacGillvray was the first of eight of the individuals present to give a lightening talk. Mark talked a bit about openbiblio.net which went Beta late February 2012 and already contains over 30,000 records. Reference was also made to bibserver which looked equally interesting. Next up was Roderic who introduced himself as a Professor of Taxonomy at Glasgow University. Rod’s talk was about the “Bibliography of Life” which contains 5 – 10 million species !! His talk was swiftly followed by that of Mahendra Mahey. Mahendra spoke about DevCSI which has been developed over the last three years. He advised that there are around 5,000 programmers/developers involved in the project here in the UK. There have been around 2,500 attendees of DEV8D events over the last four years with 7 future #DEV8D events planned for the future. Dev8D: The best of Dev8D from UKOLN on Vimeo. Our next speaker was Laura Newman (who did a grand job speaking publicly for the first time). She mentioned that OKFN has around 7,000 members and has approximately 20 working groups including International groups based in 5 Continents. Laura then told us about the Open Data Handbook.org initiative and that version 1.0 recently went online. Straight after that, she told us about P2P University which in February had announced their School of Data venture. Around 200 people have already signed up. A short break was had around this moment in time before Ewan Klein took to the floor. Ewan gave a general overview of Open Data and cited the likes of the 1901 Census Data and spoke of the importance of making Institutional data open. Mention was also made of Semantic Web mini-projects. Shortly after Ewan, we heard from Sam Leon. Sam kicked off his talk by telling us about Public Domain Review.org which was about “open cultural knowledge and to promote the value of public domain, thus enriching society”. He described it further as a “commons of knowledge that can be drawn from”. Fascinating stuff !! Next followed two impromptu talks, the first one by Etienne Posthumus. Etienne talked to us namely about Iconclass.org and the work being done in the Netherlands in relation to linked open data. With reflection, I knew that I had seen Etienne before, albeit not IRL. Ah, yes, it was this short clip on Vimeo where he talked about some of the work he is currently involved in. Bibsoup: Interview with Etienne Posthumus (developer) from Bibsoup Project on Vimeo. Etienne is a developer on the JISC/OKFN project Openbiblio2. Here he explains his role and what he works on. The second impromptu talk and the last speaker of the event was given by Wilbert Kraan. We still had around one hour left of the time allocated to us in this room at the Ghillie Dhu so it was a great opportunity for us all to have a blether about out mutual interests in Open Data and so on. After a bit of sheep herding (yes, this literally involved some baaaa-ing), Naomi successfully managed to herd us back downstairs to the (public) bar where the chat continued for the remainder of the evening. Many thanks to OKFN and DevCSI for putting this event together. I found it very enjoyable & informative and the informal relaxed nature of the event worked extremely well. 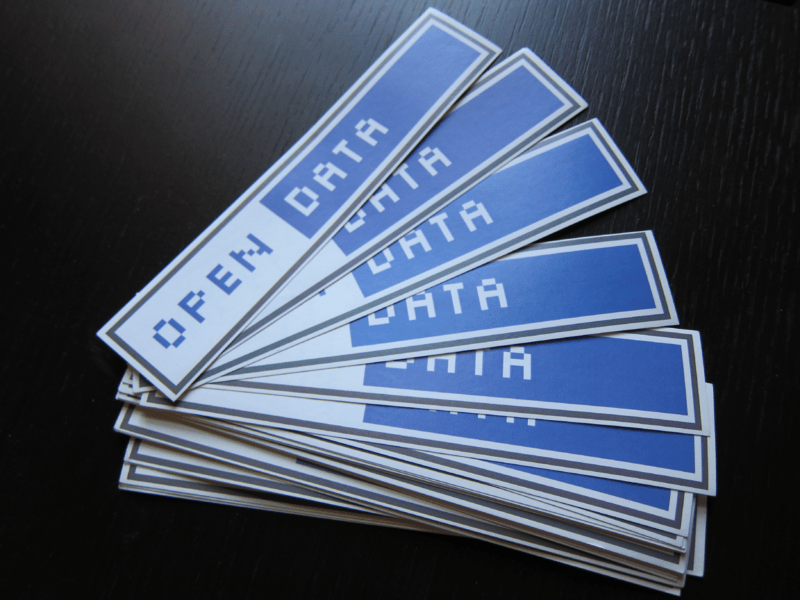 VIVA LA OPEN DATA !!! Quoting from this OKFN blog post:- “It turns out there was an event in Scotland in 2010, according to people who have been on the scene longer than I… see here for comments on the Open Biblio blog post which highlight previous activity, and many thanks to the people who kindly contributed this information. Here’s to the next one”. This entry was posted on August 23, 2013 at 7:20 pm and is filed under Uncategorized. You can follow any responses to this entry through the RSS 2.0 feed. You can leave a response, or trackback from your own site.